The first day of Specsavers County Championship action did not disappoint with a whole host of impressive performances to catch the eye in the top tier. With Surrey not in action in the first round of games, the chase is on to stop the county champions regaining their crown. And both Hampshire and Nottinghamshire have given themselves solid platforms on which to build thanks to strong displays with the bat. Here’s the best of the action from the opening day. Ben Slater and Ben Duckett (43) ensured a solid start for their new county with a stand of 75 before fellow new signing Joe Clarke stole the headlines with a brilliant century. 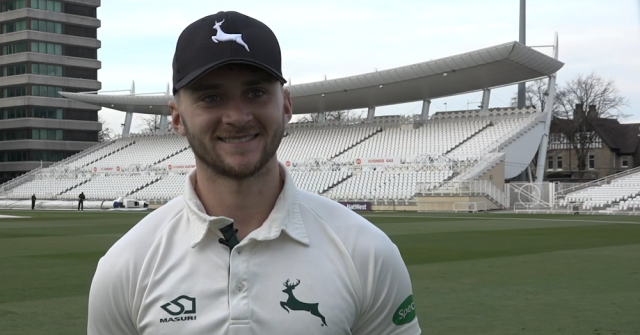 WATCH | The moment Joe Clarke reached his #Notts debut century – the first by anyone in the @CountyChamp this season! Clarke, in front of England captain Joe Root, reached his century late in the day from 165 balls to begin the season in fine style. Controversial Kolpak signing, Duanne Olivier, returned figures of 2-74 on his first outing but Yorkshire would have been hoping for a better return after electing to bowl first at Trent Bridge. Hampshire made good progress as all eyes were on Ashes hopeful, James Vince, as he began the season in an opening role for his side. Vince (40) comfortably saw off the new ball and progressed well before falling leg before to Ravi Bopara shortly before lunch. It's been a well-paced knock from him so far as he continues to build – 231-3 (59 overs) now on the board. Overseas signing, Aiden Markram, chipped in with 63 before Sam Northeast and Rilee Rossouw continued their captain’s good work with a partnership of 117. Rossouw fell before the close but Northeast will be hoping to reach three figures early on day two. Kent would have been itching to get their teeth stuck into life in Division One, but their bid for an early outing was thwarted due to the weather. They’ll bid to go again tomorrow with Somerset – high-flyers in the past two seasons – also keen to get their season off and running. If Joe Clarke gets anywhere near the England team within at least a year, then I’ll surrender my England support! If he matures then I have no qualms about him playing but that takes time.